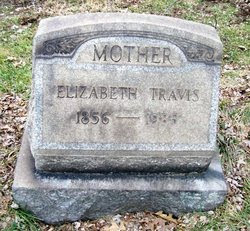 Elizabeth was the wife of Joseph Travis (1858-1924) and the mother of George Henry Travis (1889-1920). Is Ellam a family surname? At first I thought it was a middle name, but then I checked out your name --- and I wasn't sure. Thanks for sharing a lovely headstone with us. Ellam is my husbands surname. It is more common in England.